The Makita RT0700C (recently updated to RT701C) occupies a nice position in the router market alongside its most visible competitors from Bosch and DeWalt. Originally, compact routers such as these were exclusively designed for trimming and shaping the borders of laminates such as kitchen worktops. 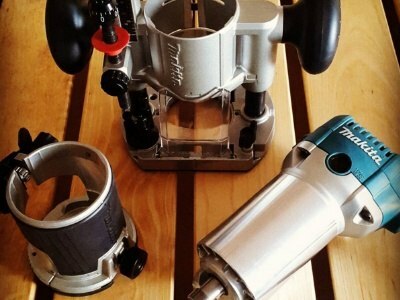 More recently, the accessories and design of these tools have made them viable alternatives to larger-format hand routers, plus they are a common feature as the spindle in homebrew CNC routers. For guitar work, compact routers are light and nimble enough to work around headstocks and powerful enough to do all but the heaviest shaping around a solidbody. The motor is available in a number of different packages. The smallest comes with the motor, a fixed base, light edge guide and edge trimmer guide. The fuller kit forms consist of a variety of bases, accessories and storage solutions. Many of these have parts that can be interchanged to suit the task at hand resulting in a smart and flexible package. Purchasers can either pick up a very complete kit at a good price, or buy the minimal kit and supplement it only with the parts they need potentially making a small saving. Underneath the hood, the Makita has soft start to reduce torque spin when powering up the router and constant speed electronics to maintain cutter speed even when labouring in heavier cuts. Speed adjustment from 10k-30k allows cutters to be run only as fast as the jobs requires them to. 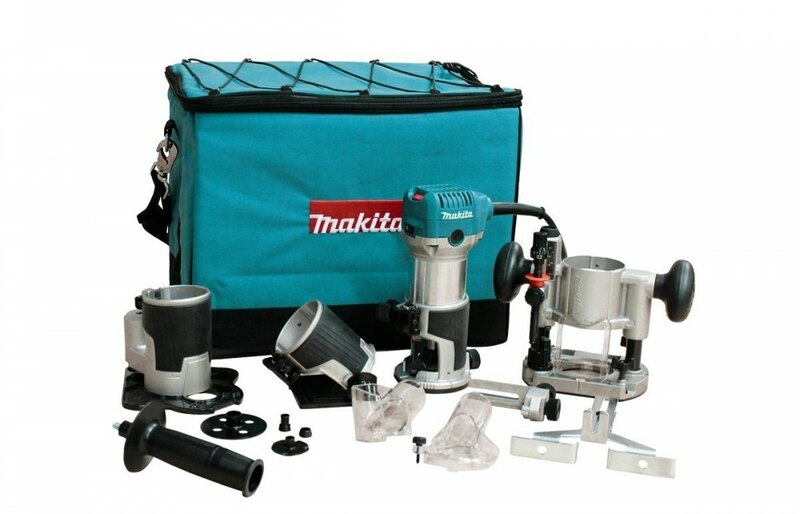 Capacity-wise, the Makita can be supplemented with a range of collets from 1/4" and 3/8" Imperial, or 6mm and 8mm Metric. The motor is rated as 710W giving it a fair amount of go in a very compact unit compared to the Bosch Colt at 600W but falling a little short of the heavier DeWalt at 900W. On paper the Makita hits the target points that some routers miss by a mile. How much rubber does the Makita really put to the road and how far can we take it? CM: I opted for a barebones RT0700C motor body which came supplied with a 1/4" collet cone, the fixed base and trimming edge guide. I added the plunge base, dust collection connectors and an 8mm collet cone to suit my personal needs. Short of the guide bushings this seems like the best combination for me. I guess you snagged a full kit, Andrew? AK: Actually, my kit was pretty barebones as well. In my box was the motor with 1/4" collet, fixed base, and a straight edge guide. I wish mine had come with the edge trimming attachment, that looks like a genuinely nice piece to have. For my own usage habits, I haven't felt the need to pick up any additional bases. I will end up buying the dust collection accessories at some point later, likely when I can set up my own dedicated work space with good collection. AK: I agree, this router definitely has great potential for modification and use in various jigs and fixtures. Actually, one of the main reasons I picked this model was the compatibility with standard Porter-Cable style guide bushings. This is a huge boon for me personally, as I like to use guide bushings for a variety of tasks. CM: I decided not to pull the trigger on the standard Makita bushings too. I know a bunch of people like yourself use third-party bushings, so I definitely think a good set of them is in my future. I guess that being Porter-Cable style, then the Whiteside router inlay bushing set would be compatible too....definitely useful for things like flush-fit control plates. Okay, well let's get this on the road....firstly, I'll void my warranty for the greater good!